TNPSC Current Affairs and GK Today: Theeran Chinnamalai Birth Day Notes in Tamil April 22, 2017 for TNPSC, TRB, TET, TN POLICE, UPSC, RRB and Other Government Competitive Examinations. 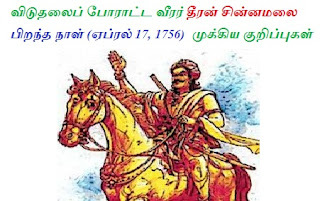 Theeran Chinnamalai was a Tamil chieftain and Palayakkarar of Kongu Nadu who fought against the British East India Company. Dheeran Chinnamalai was born as Theerthagiri in Melapalayam, Chennimalai near Erode in Tamil Nadu.